The Frugal Family Life: RARE $1/2 Ronzoni Pasta Coupon!! I'm so excited about this one!! We haven't seen a pasta coupon in forever!! 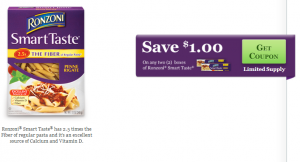 Head over and print this $1/2 Ronzoni Smart Taste Coupon! These go on sale often, and after the double we should be able to get them super cheap, if not FREE! !